Wigs are more than just a great addition to your beauty routine: they can boost your sense of self-esteem, help you follow the dictates of your faith, or make you feel more comfortable as you undergo cancer treatments. Learn more about the benefits of wearing human hair wigs. New to Wigs? If you're unclear about how to narrow down styles and pick ones that will work best for you, our Wig Buyer's Guide is here to help! Like selecting a diamond, choosing a wig requires some understanding and appreciation for details. This guide will tell you how to pick a suitable natural wig for yourself from a-z. How to pick a wig? Customizing your style：Before wearing your wig for the first time, take it to your hairstylist and have them trim the bangs and sides to suit your face. If you plan on coloring a human hair wig for black women, we recommend having your hairstylist do it. Meanwhile, your head’s size would affect your wig. How to measure your head’s size? Measure the circumference of your head. Whether you buy your wig in person or online, you will need to know the size of your head. Take a cloth measuring tape and wrap it around your head. It should start in the middle of your forehead, go down to the base of the skull where the wig will end, and then wrap back up to meet the start of the tape on the forehead. Make sure as you wrap the tape around your head, that you keep the tape above your ears. When you choose a wig with baby hair for yourself, you will find, there are so many types wigs in the markets. Synthetic wigs are the ones which are now the most popular. Synthetic wigs are pre-styled so you can try on a ton of different looks. Synthetic wigs are durable and still maintain their style after being washed. Synthetic wigs are inexpensive and easy to clean. The fibers of synthetic wigs look and feel like human Hair. Remy human hair wigs have the cuticle still attached at the ends and aren't processed. These wigs are sometimes called, "virgin hair" and "cut hair" wigs. Remy wigs have also been sorted so they are all facing the same direction. They feel softer to the touch and have less tangling. These are the major classifications of wigs. There are other types of wigs too. Full lace units come with different specifications. They are lace, but they have urethane strips of adhesives to stick to. You can use lace tapes directly on the lace it's self without the tape shining through the unit. Lace front wigs have the same appearance with full lace wigs. 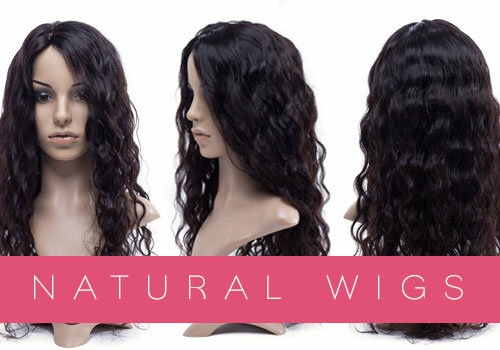 The lace frontal human hair wig is completely designed with a sheer lace along the front hairline attached to the front of the wig. Which makes it looks as if the wig hair is growing from your own scalp. In comparison to front lace wigs, full lace wigs are more expensive as it takes longer to make. It will take a technician 3-5 days to finish the crocheting process of full lace wig. For me,I prefer the later. Next, we should choose the color, how to select a suitable color for you? As most styles offer a range of color choices, this is a good final step. As you zero in on styles you like, you can begin to review the colors available. If you're new to wearing wigs, consider staying close to your natural shade to ease the transition. There are so many brands, which is best? You can search the review from Youtube, Google, ins and others. This review is based on extensive research and testing. You can read reviews all over the Internet, discussed with cheap hair users, studied the websites and social media accounts of the vendors and researched where they get the hair. After you get your wigs human hair, you should study how to care them, you can also learn this knowledge from youtube or google, there are many video and articles in detail to follow. The cost of buying a wig can vary anywhere from $50 - $3000. It's up to you and the features and benefits you feel are important in your lifestyle. The good news…There is a wig for any budget and even a less expensive wig can be a nice Choice. Just lower your expectations on the time it will last.